This morning, the US Federal Highway Administration published a new edition of the Manual on Uniform Traffic Control Devices (MUTCD). The December 2009 Edition of the MUTCD contains a number of new standards that apply to bicycle facilities. A couple of interesting additions (for me) to the MUTCD: Bicycles May Use Full Lane Sign and the Shared Lane Marking aka "Sharrows." 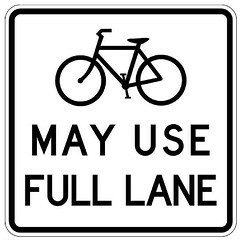 The 2009 MUTCD says the "Bicycles May Use Full Lane" sign (a white rectangular regulatory sign) may be used on roadways where no bicycle lanes or adjacent shoulders usable by bicyclists are present and where travel lanes are too narrow for bicyclists and motor vehicles to operate side by side. For support, the MUTCD refers to the Uniform Vehicle Code, which "defines a 'substandard width lane' as a 'lane that is too narrow for a bicycle and a vehicle to travel safely side by side within the same lane.'" The Shared Lane Marking, popularly referred to as the "sharrow," has also been approved for this latest edition of the MUTCD. The sharrow may be used in addition to or in place of the "Bikes May Use Full Lane" sign. According to the MUTCD, the sharrow assists clists with lateral positioning in a shared lane with on-street parallel parking in order to reduce the chance of a bicyclist's impacting the open door of a parked vehicle; and assists bicyclists with lateral positioning in lanes that are too narrow for a motor vehicle and a bicycle to travel side by side within the same traffic lane. The MUTCD also explains that the Shared Lane Marking alerts other road users of the lateral location bicyclists are likely to occupy within the traveled way, encourages safe passing of bicyclists by motorists, and reduces wrong-way bicycling. Sharrows are not to be placed within shoulders or designated bike lanes. Where's there's on-street parking, the center of the sharrow must be at least 11 feet from the curb or edge of the road. Where there's no on-street parking, the sharrow must be at least 4 feet from the curb or road edge. The MUTCD is the bible for state Departments of Transportation for all traffic control devices. This manual defines a standard placement, size, colors, and guidance pavement markings, signs, and signals on the road. By law, the MUTCD is the national standard for traffic control devices any street, highway, or bicycle trail open to public travel. State DOTs are required to adopt the new MUTCD within two years. States are not required to use every traffic control device mentioned in the MUTCD -- for example, states are not required to install "Bikes May Use Full Lane" or sharrow markings on substandard width lanes. They do now have the option to use these signs, however, without having to file a request for experimentation or running afoul of Federal transportation law. I've worked with a couple of local government transportation departments, for example, who were interested in sharrows but did not want to use them because they weren't in the MUTCD. This new edition of the MUTCD is a powerful tool for cycling and cyclist advocates. Cycling facilities and markings are no longer an afterthought but an integral part of the National MUTCD. Big props to Richard Moeur, a transportation engineer on the Bicycle Technical Committee who worked several years to include this signage and guidance in the current edition. Thank you also to Bob Shanteau for passing word of the newly approved manual along. Traffic Controls for Bicycle Facilities are described in MUTCD Chapter 9. Great news, but where's the anti-bike signs? Glad to see it -- how much weight does this Federal design guide carry, though? Are states required to follow it? Good to see dimensions for sharrows...now it's time to go out to the laboratory and make a stencil for some "guerilla sharrowing" Muuwaahha ha ha! Ghost: States have two years to adopt the MUTCD. States aren't required to use the bike signs in the MUTCD, but local governments are no longer prohibited from putting those signs up.